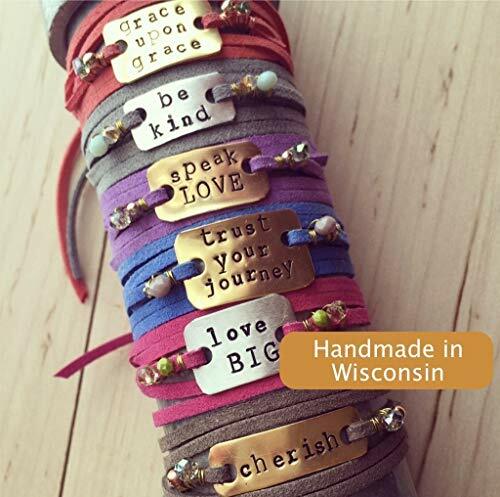 Say anything you want with this customized leather wrap bracelet! These make great bridesmaids gifts, graduation gifts in school colors or personalized birthday gifts. These bracelets use REAL metal (Aluminum, Brass, Bronze, Nickel or Copper), no plated or "filled" metals which rub and chip off. Plated and filled metals is a thin chemical coating over a cheap metal. Looking for a color that's not in the drop down? This is due to an Amazon limit of choices. Just leave the color you'd like in "notes to seller". If you're looking for a specific color not shown, please message me first so we can try to get it for you. Every bracelet is around 36" long which should allow you to wrap it easily 3-4 times around your wrist. Due to its adjustability, it's made to fit practically any wrist size. If you have any questions about this product by IF Only Pretty, contact us by completing and submitting the form below. If you are looking for a specif part number, please include it with your message.